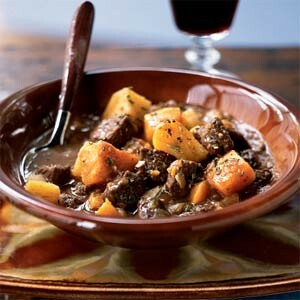 For a taste of the Irish, theres nothing better than a satisfying lamb stew! For me, slow cooker stews are a great comfort food. What? Youre telling me I shouldnt use food for comfort? Youre probably right, but when its as good for you and as satisfying as this recipe, I cant resist! This one is high on flavor and relatively low on fat; less than 24% fat for the main dish. I like to pair this stew with a crusty sourdough bread which is nearly fat free and perfectly delicious for dipping in the stew (dont use butter, of course). Now you can have your yummo Irish Stew, and eat it too. For lamb stew, leg meat is considerably lower in fat than other cuts and offers great flavor. The leg meat contains enough connective tissue so that it becomes relatively tender when cooked at a low temperature for a long time. To keep things significantly healthier, always be sure to trim all meats of any visible fat before you cook them. Another strategy for making a stew lean is to load it with vegetables. They add essential flavor and are filling, but low in fat and calories. Mushrooms in particular add a deep, satisfying flavor to stew, plus they have a chewy, almost meaty texture. This Irish lamb stew has all the flavors youll want for a St. Patricks Day meal. And the prep couldnt be simpler: Combine everything in a slow cooker set on low. Enjoy it seven to eight hours later. 1. In a small bowl mix the red wine, mustard, salt, and pepper and place in the insert of the slow cooker. 2. Layer in the lamb, and then scatter remaining ingredients around the lamb. 3. Cover the slow cooker, and then cook on low until the lamb is fork-tender, about 7 to 8 hours. 4. Stir in the parsley and juice of one lemon just before serving. Note: The fresh lemon juice will add brightness to the flavors. Per serving: 266 calories; 7 g fat (2 g saturated); 65 mg cholesterol; 27 g carbohydrate; 23 g protein; 4 g fiber; 427 mg sodium. 2 Comments on "LOW FAT IRISH LAMB STEWThat Will Have You Doin the Jig!Less than 24% Fat"
Sounds like a great lamb recipe. Do you know if there is any way to be able to cook it quicker? 8 hours is a very long cooking time, and I was wondering if there may be a way to prepare it more quickly?